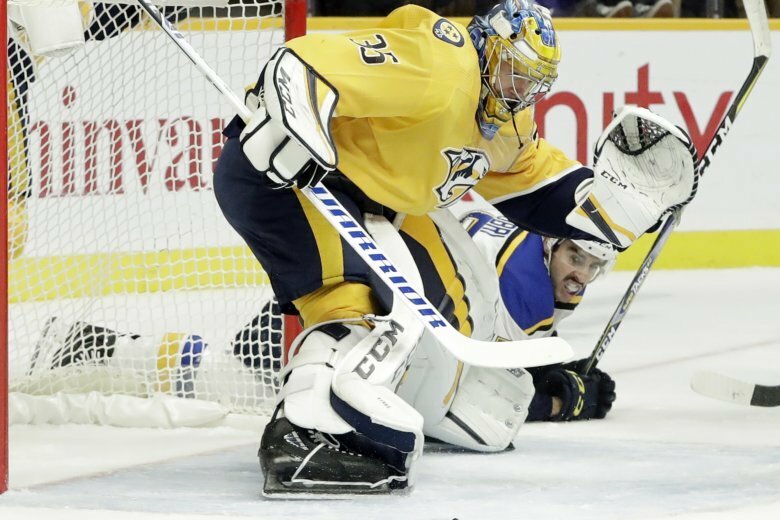 NASHVILLE, Tenn. (AP) — Pekka Rinne leads the Finns in wins. Rinne made 28 saves to set an NHL record for victories by a goalie from Finland, and the Nashville Predators beat St. Louis 4-1 on Wednesday night in Craig Berube’s first game as Blues coach. Frederick Gaudreau, Filip Forsberg, Austin Watson and Ryan Ellis scored for Nashville, which has won three straight. Rinne earned his 320th career win, surpassing Miikka Kiprusoff for most by a Finnish-born goaltender. Nashville selected Rinne in the eighth round of the 2004 draft with pick No. 258. Robert Thomas had the lone goal for the Blues, who have lost three in a row and five of six. Berube took over as interim head coach Monday night when Mike Yeo was fired following a 2-0 loss to the Los Angeles Kings. St. Louis has managed one goal in its last three games. In the opener of a home-and-home set between the teams, Gaudreau scored at 6:14 of the first period. Blues goaltender Jake Allen stopped Anthony Bitetto’s slap shot from the left point, and Gaudreau collected the rebound. His first attempt was stopped by Allen, but he quickly put in the rebound for his first career regular-season goal. During the 2017 Stanley Cup Final, Gaudreau scored three goals for the Predators. Thomas scored his first NHL goal at 12:39 of the first. Brayden Schenn intercepted an attempted pass from Predators forward Nick Bonino and sent a pass to Thomas on the left side, where he beat Rinne with a wrist shot from the left faceoff dot high to the glove side. St. Louis drafted Thomas with the 20th overall pick in 2017. Forsberg made it 2-1 at 13:22 of the second with a short-handed goal. Just inside the Nashville blue line, he intercepted a pass by Robby Fabbri and quickly headed up ice on a breakaway. From the low slot, Forsberg snapped a quick wrist shot by Allen on the glove side. Watson’s wrist shot from the right half boards eluded Allen at 7:53 of the third. It was the first goal of the season for Watson, who was suspended for Nashville’s first 18 games following a domestic assault charge. He pleaded no contest. Ellis got his first of the season, short-handed into an empty net, at 14:48 of the third. NOTES: Allen finished with 30 saves. … Bonino played his 500th career game. … Nashville is 12-0-0 when scoring first this season. … The Blues have lost six consecutive games in Nashville. … St. Louis has not scored a power-play goal in seven games. Blues: Home against Nashville on Friday. Predators: Play at St. Louis on Friday.